Knowing who has been assigned what committees is important. Let’s learn about a couple of “water-senators ” ~those assigned to committees where water will come up. No pun intended. 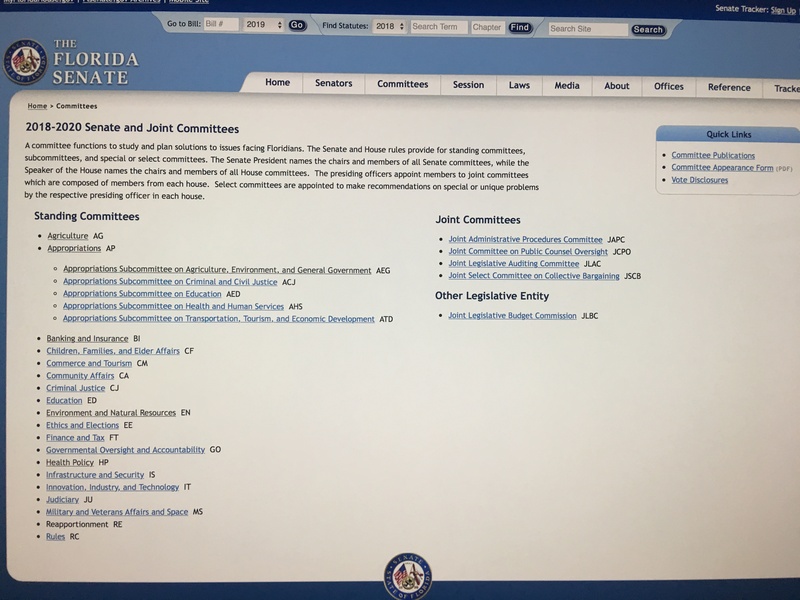 First, let’s go to the Florida Senate website and click on the Committees Tab. Look around. What titles have something to do with water or the environment? Here you will see a list of committees. Very interesting! Only a few could apply. For sure, when it comes to purposes of water, under Standing Committees, Appropriations Subcommittee on Agriculture, Environment, and General Government is key. When you click on her name you will also see she serves on the Environment and Natural Resources Committee and the Appropriations Committee. 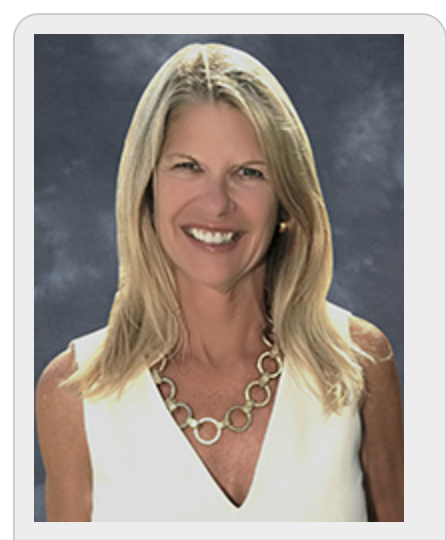 Senator Mayfield is very well versed in water issues not only because she is our Indian River lagoon neighbor, but because as she was an ally of former Senate President Joe Negron in 2018. Now, take the time now to click on these links below and see if you happen to know any of the other senators serving on either the Appropriations Subcommittee on Agriculture, Environment, and General Government or the Natural Resources Committee or anything else relevant, perhaps Tourism where water really belongs. Take note of these senators. 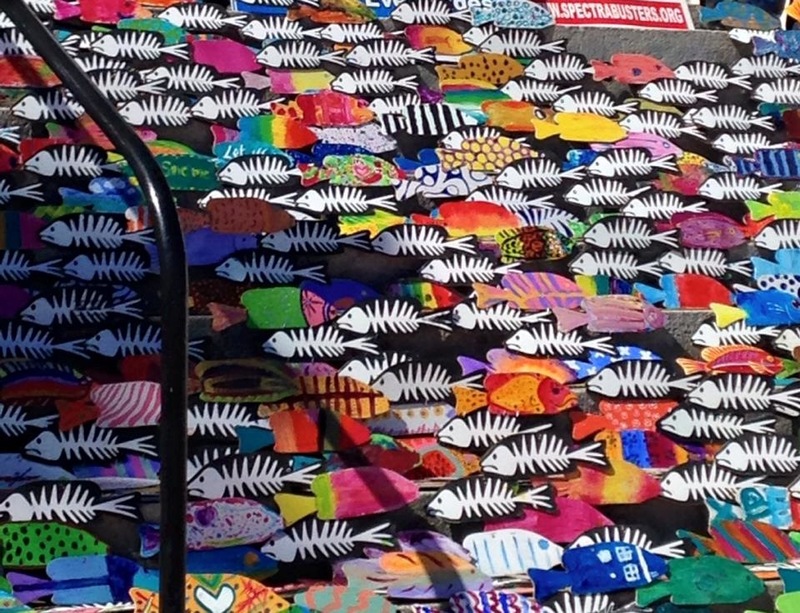 Do you know anyone who may know them? A friend across the state? Now for one more water senator. He who holds the purse strings! Appropriations Chair, Senator Rob Bradley, another Negron ally from last year. 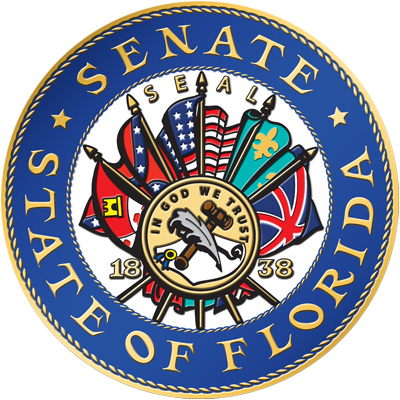 Senator Bradley represents Marion County, a region where there are many nutrient pollution/flow/algae Springs issues and concerns about development and over aquifer withdrawal. 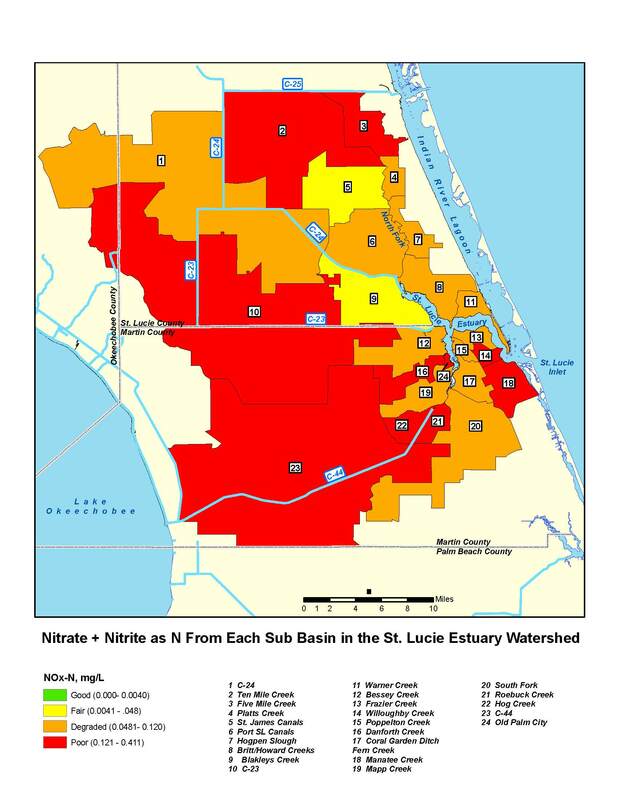 (https://www.ocala.com/news/20180114/study-finds-nitrates-not-only-problem-affecting-springs) Bradley is no stranger to water! 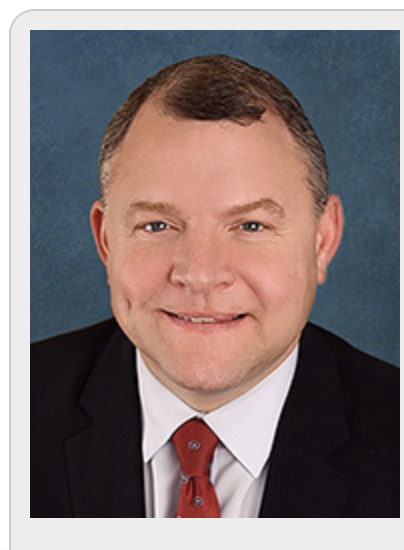 Click on his link and see what other committees he is on as well. Today I am going to stop here. There are other important positions, but these two featured Senators that have a track record. These are two you can reach out to now, along with your legislative delegation. Yes! Start building relationships NOW. If you can’ reach the legislator him or herself, call, write or go to their office and build a relationship with their staff. Like any relationship this takes time, effort, finesse, and multiple visits. Ask for a meeting just to talk about what is important to you as a citizen, no matter your political affiliation. 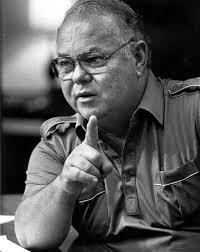 All Florida politicians represent all Floridians. Here are some tips about Effective Communication and a visual from last year to refresh our memories about how an idea becomes a law. Advocate for water now! Once legislative session begins, it’s too late! 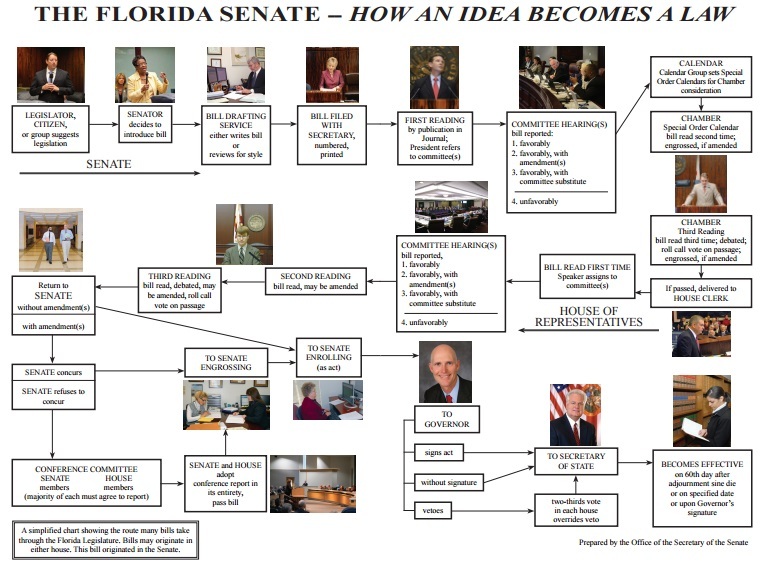 https://www.flsenate.gov/About/EffectiveCommunication and also a visual about how an idea becomes a law. Aerial of Lighthouse Point Feb. 8, 1965, Ruhnke Collection, Thurlow Archives. 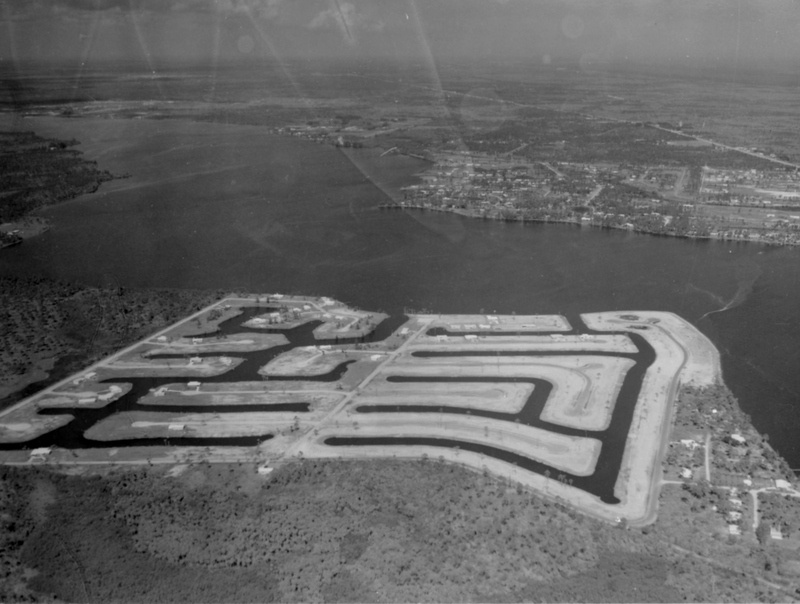 Let’s take a closer peek at this 1965 photo of Lighthouse Point in the St Lucie River. In 1965, developers had no concerns about nutrient pollution, and every property of course had its own septic tank. 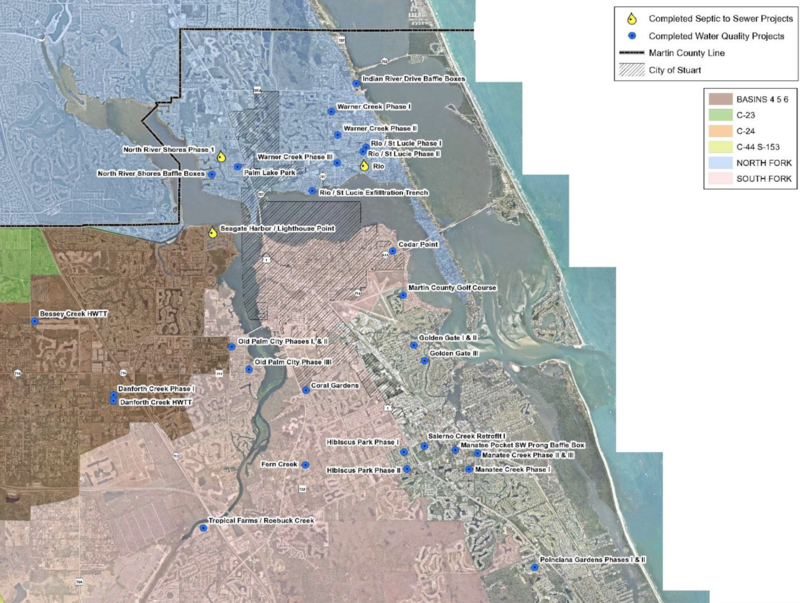 Fortunately, in the 2000s, Martin County did help residents of Lighthouse Point and neighboring Seagate Harbor, convert from septic to sewer, along with other “hot-spot” communities, as documented in this outstanding presentation by former Martin County Ecosystems Manager, Deborah Drum. See yellow dots, slide from Deb Drum’s presentation of completed projects. But there is more work to do. 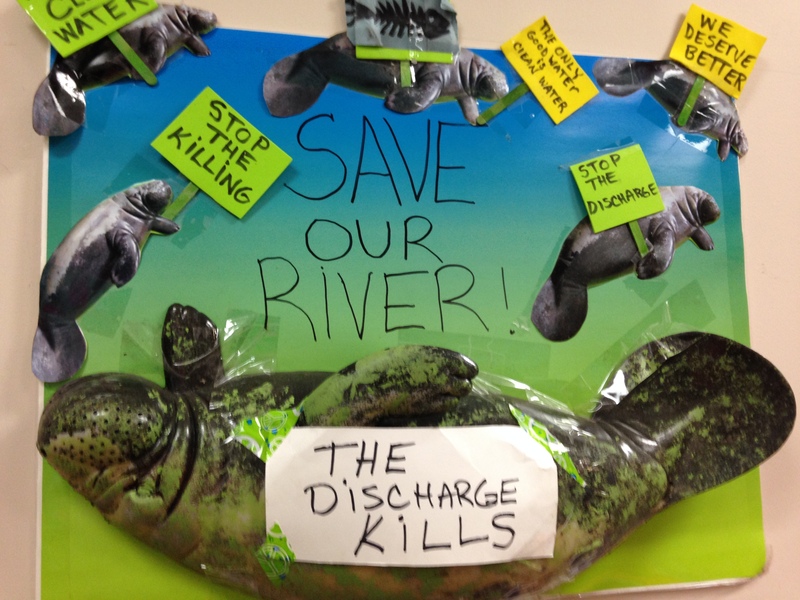 As we know, Septic to Sewer is one of those subjects people passionately fight over as we try to understand why our waterways have become so impaired. This was the case in my own hometown of Sewall’s Point. Famous for the first strong fertilizer ordinance on Florida’s east coast in 2010, a year of my mayorhood, The Commission flipped this environmental streak, and last year, when I was off the commission, following much back and forth and very poor communication, ~in spite of heroic efforts, but a totally exhausted, confused and furious public, decided not to work with Martin County for a partial sewer conversion. The backlash to this is far-reaching. 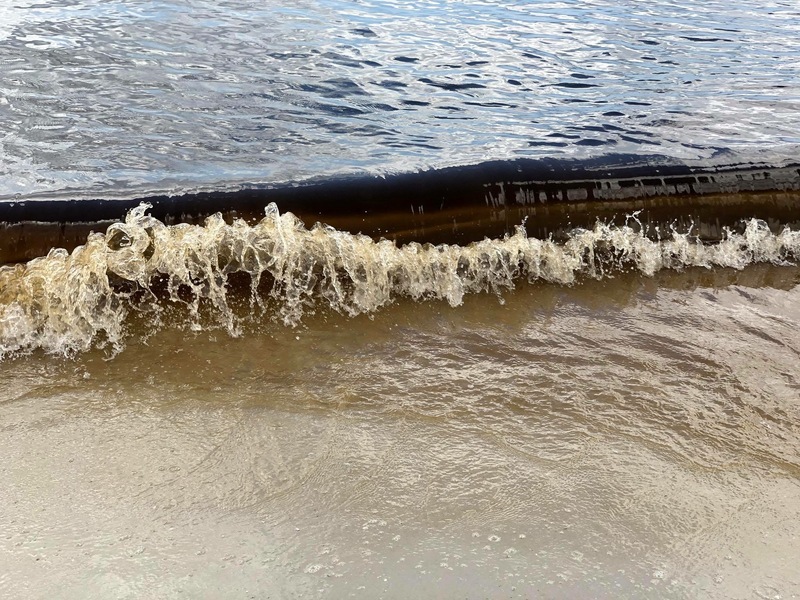 I agree that most of Sewall’s Point is not dredge and fill, but some is, and with out a doubt, old septic tanks in flood zones along the Indian River Lagoon are not a good idea. 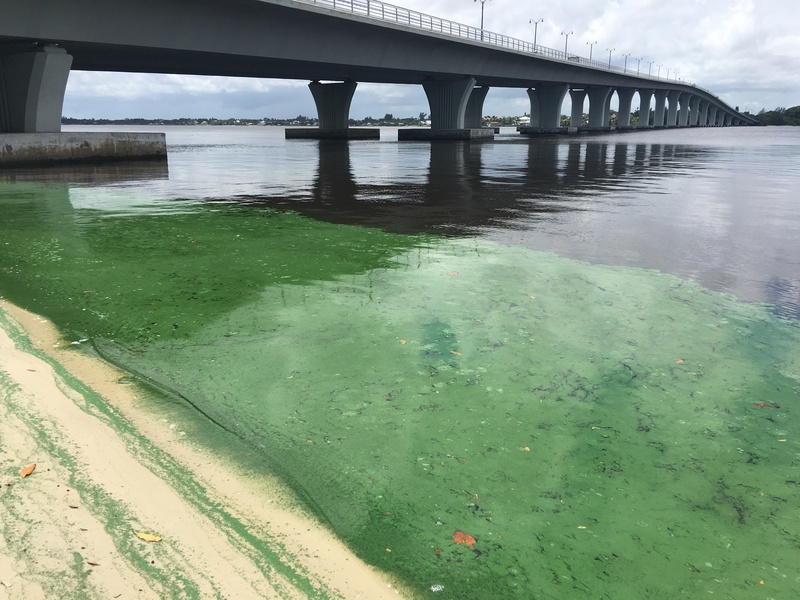 In Sewall’s Point, and all Martin County residential areas we can “feel better about ourselves” as we know that Agriculture is the primary nitrogen and phosphorus polluter into our waterways, (and they need to get to work!) by about 88% according to Dr Gary Goforth. 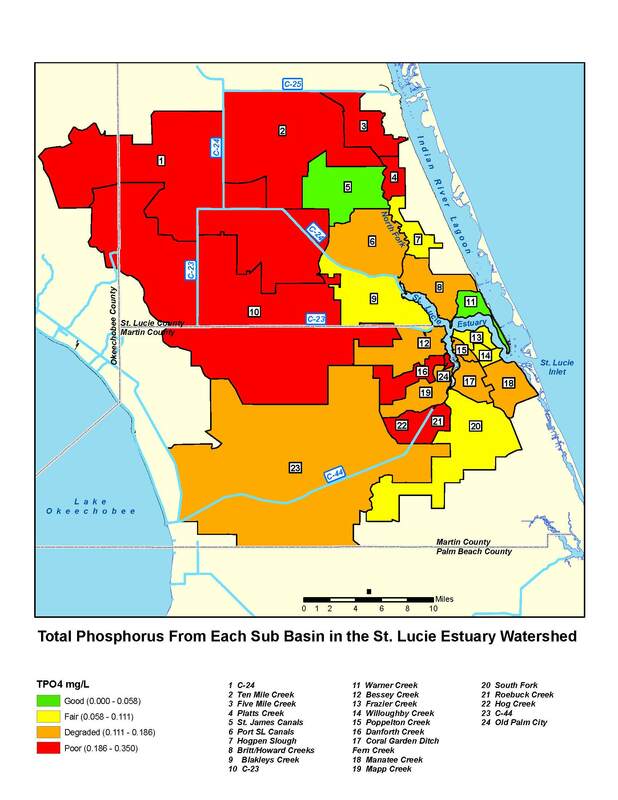 (https://jacquithurlowlippisch.com/tag/phosphorus-loading-by-land-use-what-fdep-isnt-telling-us-gary-goforth/) Nonetheless, this does not mean we should act too self-righteous to change out ourselves. 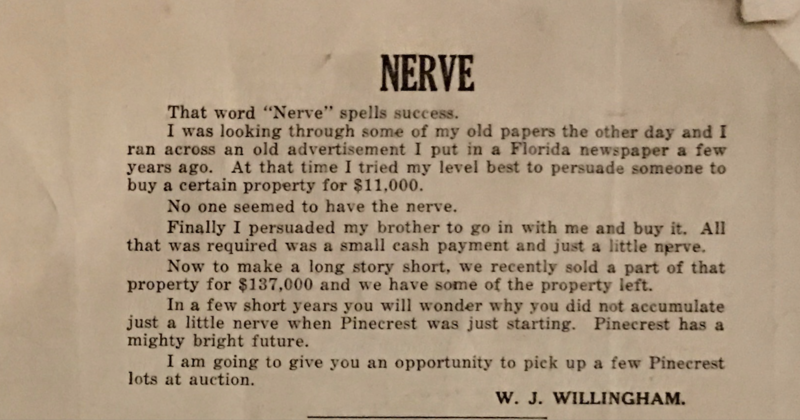 I continue to share now historic advertisements of Florida. Today’s is from my hometown of Stuart, Florida. 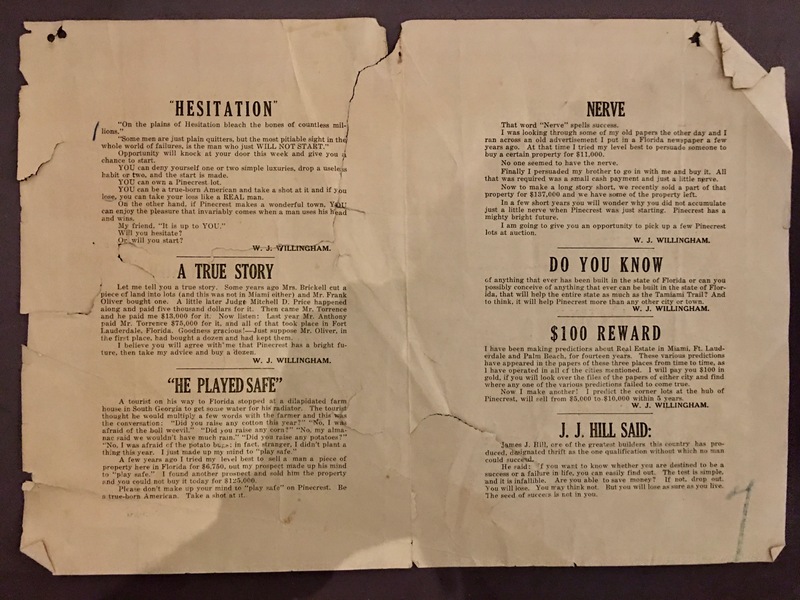 My mother, historian Sandra Henderson Thurlow, has a trove of these things, and they are interesting to view ~thinking about how much our area has changed. 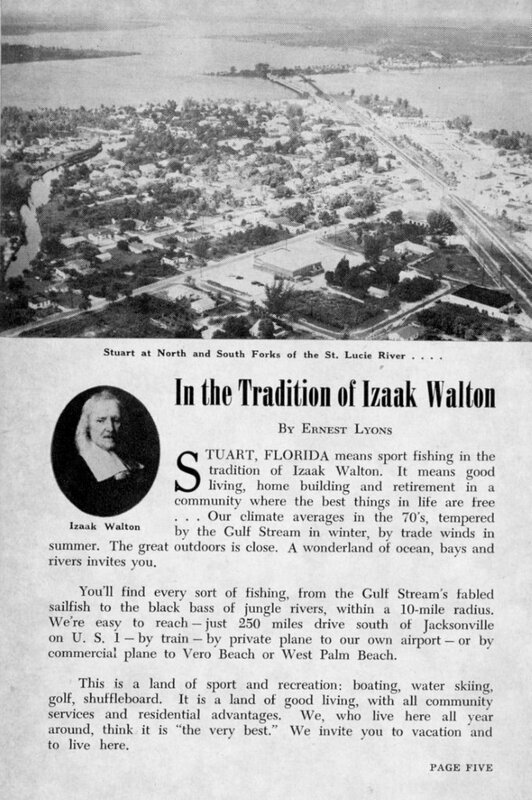 This 1957 Chamber of Commerce Fishing Guide advertisement, written by Ernest Lyons is entitled: “In the Tradition of Isaac Walton.” So let’s start there: Who was Isaak Walton? ! I had to refresh my memory as well, so don’t feel bad if you did not remember. 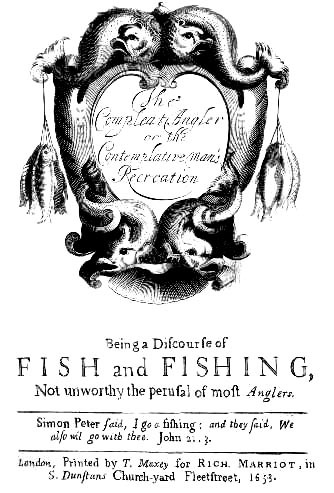 He is famous for writing the Complete Angler in 1653, a book “celebrating the joys of fishing” that inspired thousands of sportsmen, and remains a classic for both men and women today. 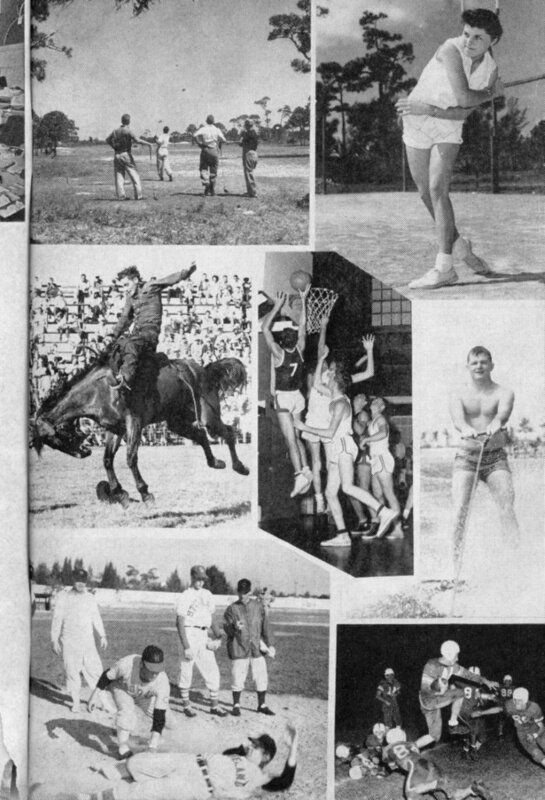 Fun for me to see, in the collage below, my Aunt Mary Thurlow Hudson is photographed far right playing tennis, and my father, her brother, Tom Thurlow Jr., #7, is shown making a basket for Stuart High School baseball team. Awesome! Those were the days! But we know that nothing is really for free. 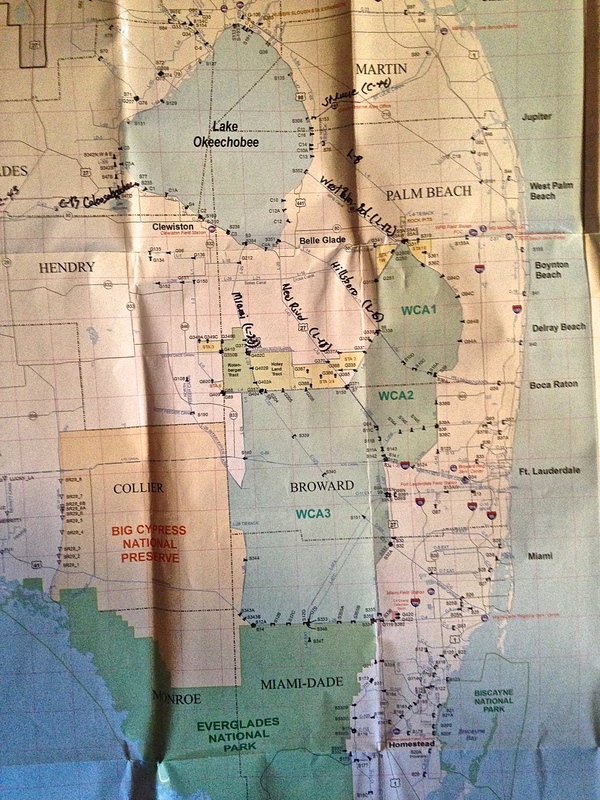 Stuart, and Florida at large have paid a price for moving so many people here since 1957, and trying to “feed the world” from our rich agriculture fields. Our youth can still golf, play tennis, ride a stallion at a rodeo, play baseball, and football, but water-skiing and fishing? Maybe not. 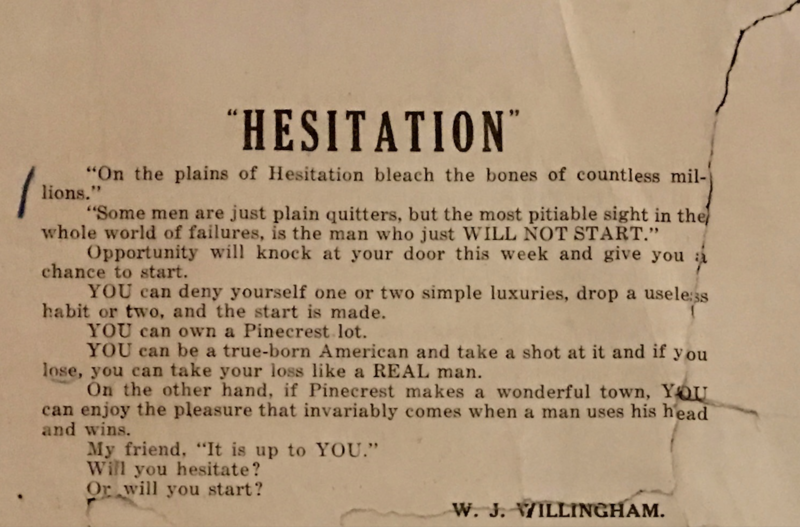 I have been looking though my collection of maps and other Florida things, and I came across this remarkable real estate ad by W. J. Willingham. 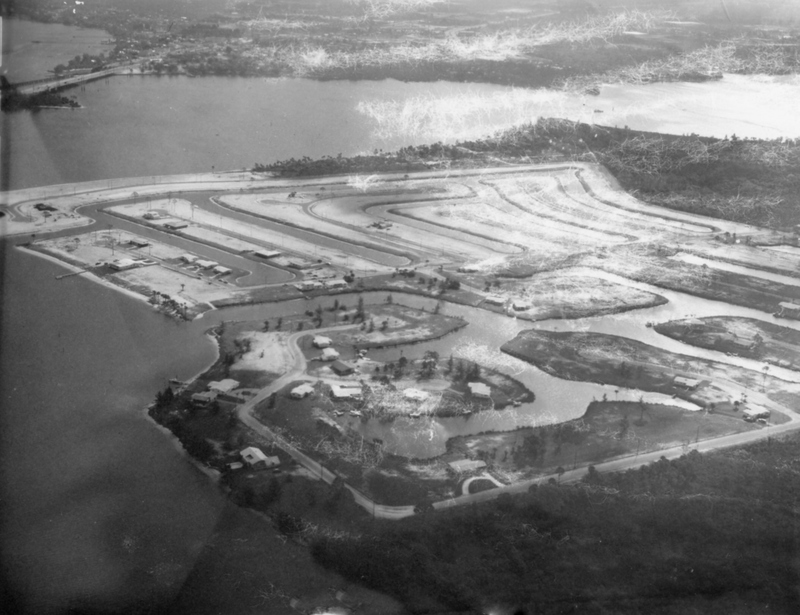 I would think it is from the early part of the 1900s when Barron Collier and James Jaudon, “Father of the Tamiami Trail,” were developing South Florida. 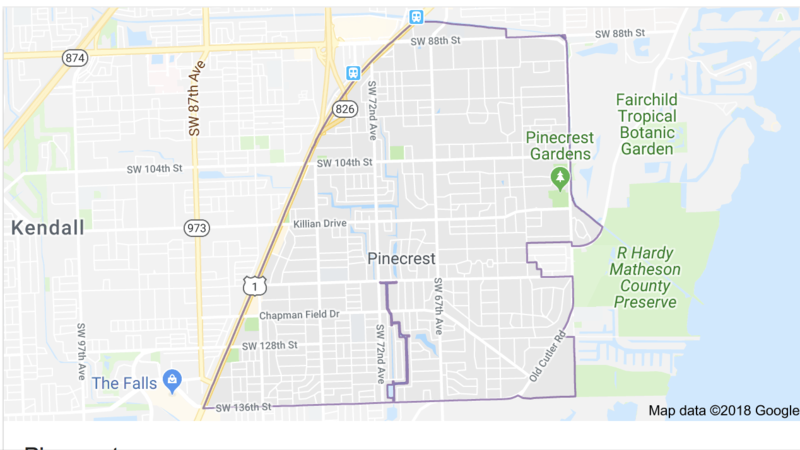 Apparently, Jaudon sold the land that became Pinecrest to Willingham. Holy cow. This must have been the way one sold land in the Everglades in the old days, before political correctness, equal rights, and other things. Interesting to ponder, don’t you think? Maybe that’s why they mowed everything down. This is a good one, today we would write “Do you know of anything that has destroyed America’s Everglades more than Tamiami Trail? The seed of success not in you? Hmmmm. I agree with being thrifty, but how the “seeds of success change.” To be successful, the new developers of South Florida will have to adapt to our new world of rising seas, stronger storms, climate change, and the subtleties of selling to modern society. 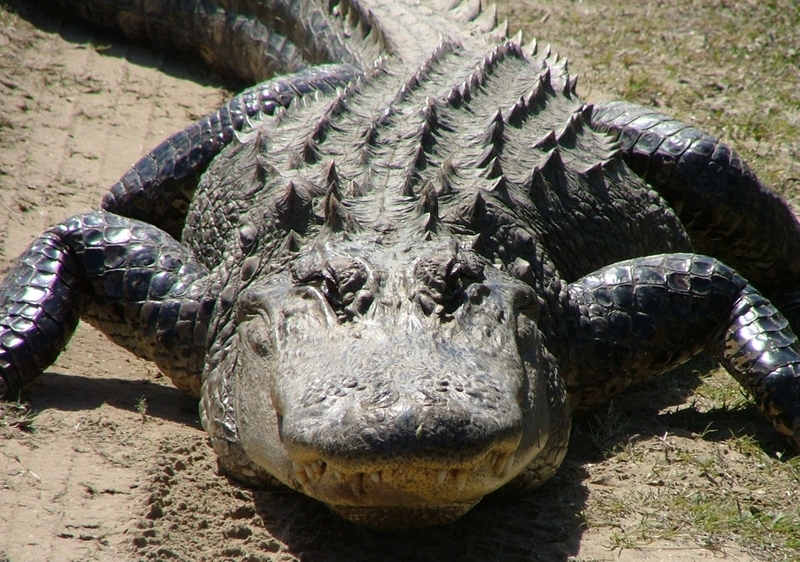 This could be a challenge; we may have to get some advice from the gators who have around a long, long time. A rather remarkable thing happened. 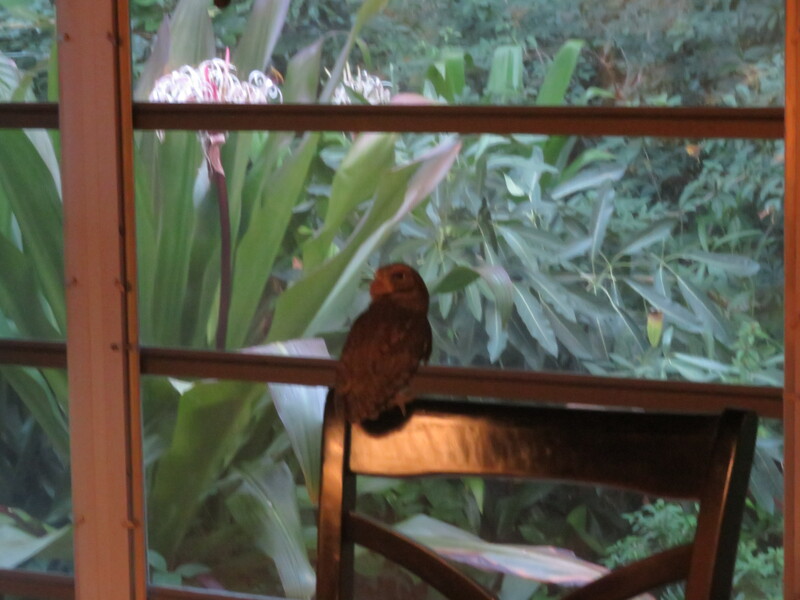 There was an owl in my kitchen. Yes, an owl, a real owl. 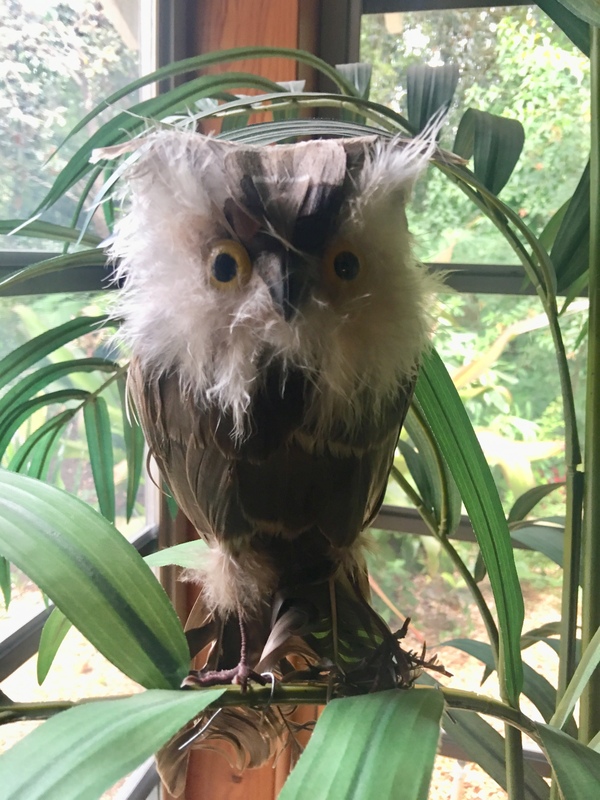 Just a few days ago, I had bought a fake, feathered owl at the Lamp Shop. I attached it to a fake palm tree in my sunroom. You know, the kind of thing with wire for feet, so you can twist it around the branches? So, in the darkness of early morning, I wondered if Ed had put that thing on the back of the chair just to freak me out. He had not. 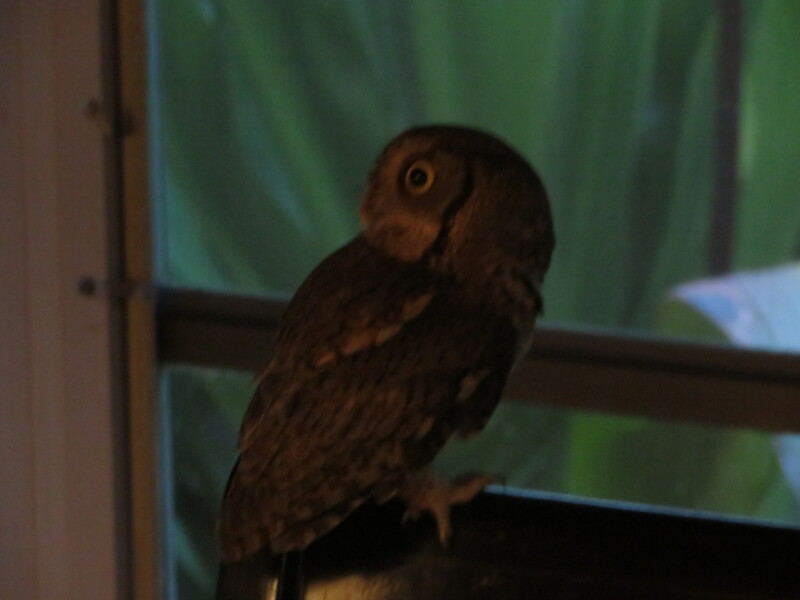 I looked again and again, and for certain, a living screech-owl was sitting in my sunroom, in my kitchen. Unbelievable! I quietly snuck over and closed the surrounding pocket doors to that area. And then quickly went to find my husband, Ed. Ed got up out of his chair, leaving the computer with the dogs gleefully trailing behind him. “Put the dogs in the crates, now!” I said. Ed looked at me, confused. “In their crates! ” Again, I stated. “O.K. he said.” Looking bewildered. “Do you mean that owl you bought at the store?” Ed snickered. I slowly slid open one of the pocket doors. 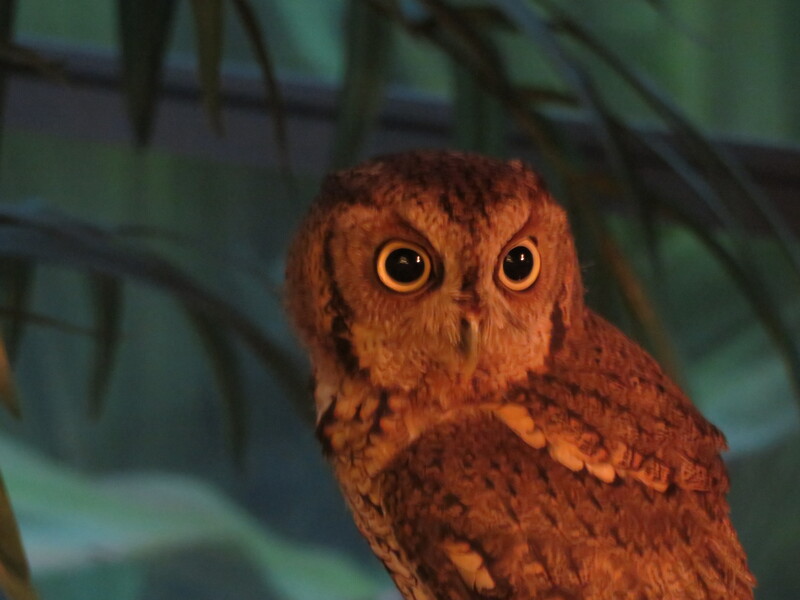 Sure enough, the beautiful little owl sat there with its head turned towards the fake owl. Ed let out an explicative and shut the door. 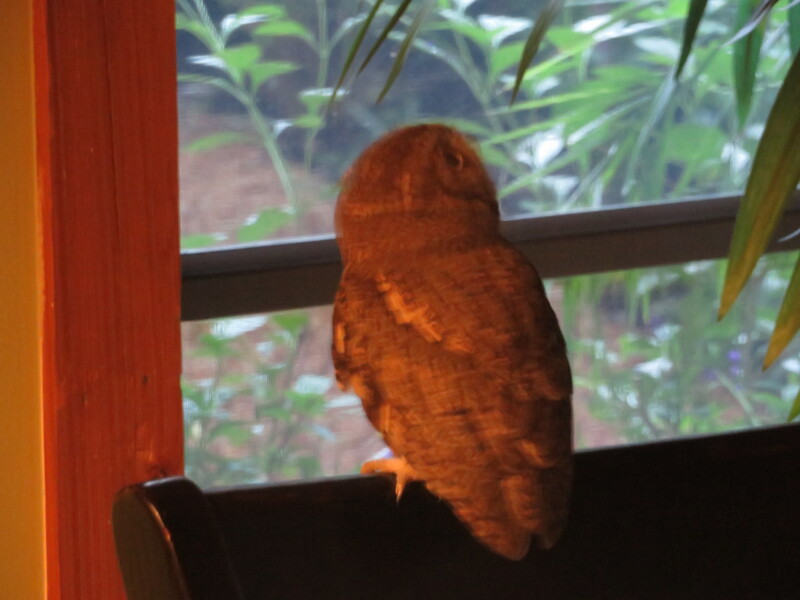 “The owl must have seen the other owl from outside.” I whispered. ” How did it get in?” Ed quietly asked. Ed and I looked incredulously at one another, then smiled. Gently opening the door, we slowly snuck over, as quiet as could be. Ed started removing the screen from behind the joulosy windows. 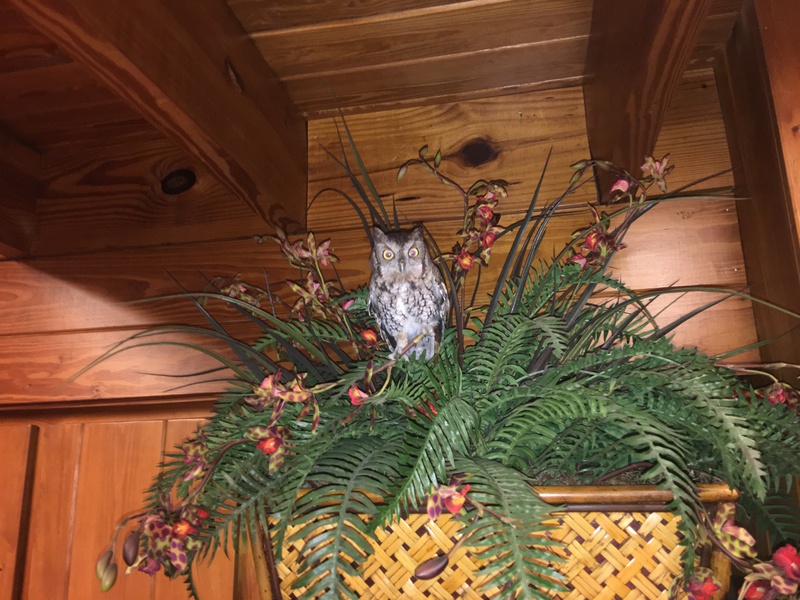 The owl lifted off the chair and flew about the kitchen landing by the fake owl, but the plastic branch sunk under its weight so it flew off and around the kitchen in high circles without a whisper. Ed and I were transfixed, fascinated. When it landed, we took pictures. Ed finally got the screen off and cranked the window. It popped open, braking the silence of the morning. Wind blew inside the room. 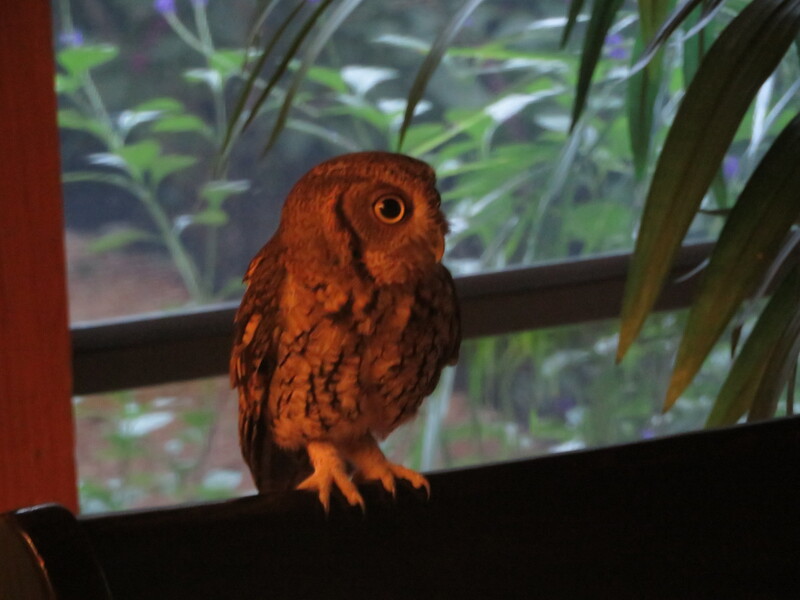 The owl looked back to its friend, and then, without a sound, flew through the window, and was gone. Definition of fertilizer: one that fertilizes specifically, a substance (such as manure or a chemical mixture) used to make soil more fertile so things grow. Usually containing phosphorus and nitrogen. 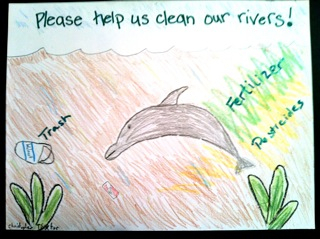 “Death by Fertilizer” or “Our Sick Friends” was originally a booklet created by the River Kidz in 2012 to bring awareness to the ailing health of the bottlenose dolphins in the Indian River Lagoon; I think the message remains a relevant teaching tool today. 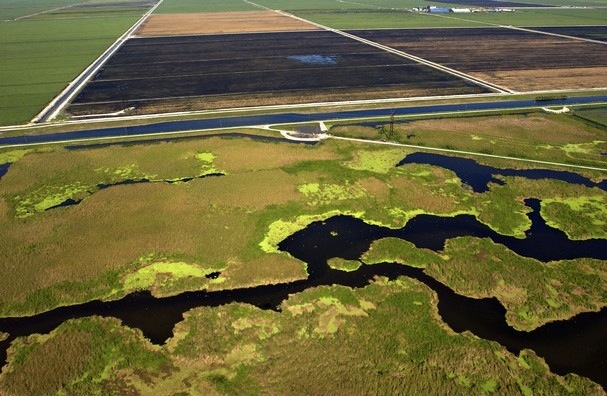 ~The Lake Okeechobee Watershed: 88% agricultural in nature running into a now sick, eutrophic, algae-ridden, Cyanobacteria filled Lake; a 700,000 acre Everglades Agricultural Area south of the Lake allowed to back bump when flooding occurs; all this water, in turn, discharged into the ailing St Lucie River and the Caloosahatchee Estuary by the ACOE while the SFWMD and FDEP, and their bosses, the Executive and Legislative branches of government look on. 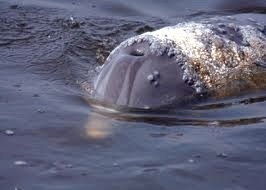 This putrid, polluted water runs out into the ocean. 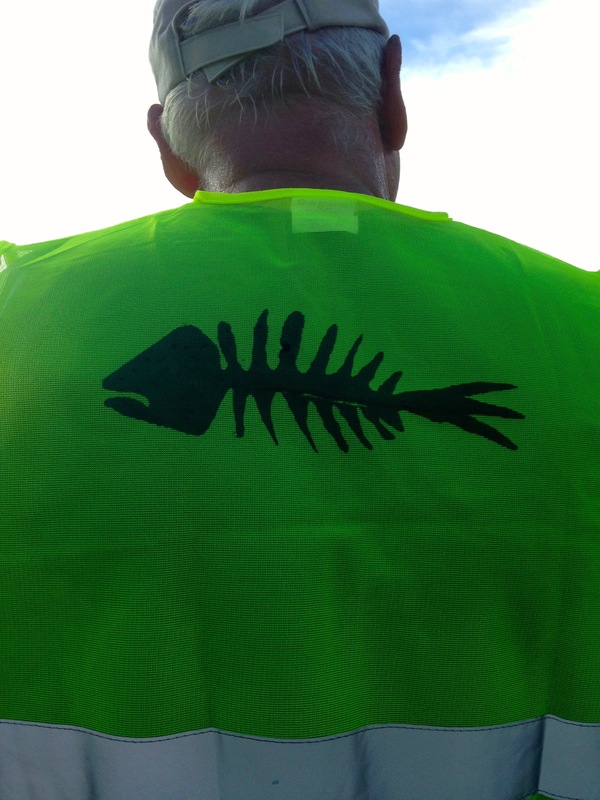 We think that’s the end of the water destruction, but it’s not, as red tide and seaweed are fertilized, growing into monsters we have never seen before. Septic and sewer pollution is a type of fertilizer too. Some people around the world fertilize their crops with their own human waste; dog poop is also a “fertilizer,” and all this fertilizer leeches or runs off into our estuaries and ends up blending with the polluted Lake O water coming down the pike to the ocean. Every rain event runs right down the storm drains of our neighborhoods and shopping malls with all the “crap” it carries. We designed it that way, years ago, and have not changed this model. The fertilizer put put on our lawns, of course, runs off too. The fancy, confusing words of “nutrient pollution” must be replaced with “fertilizer,” something we can all understand. From the time we are children, we learn that “nutrients” are good, they make us strong. Fertilizer can be good, but we instinctively know it can also burn. We know not to eat it; it is not nutritious. Nutrient Pollution is an oxymoron created by industries and government so we have a hard time understanding what is going on. 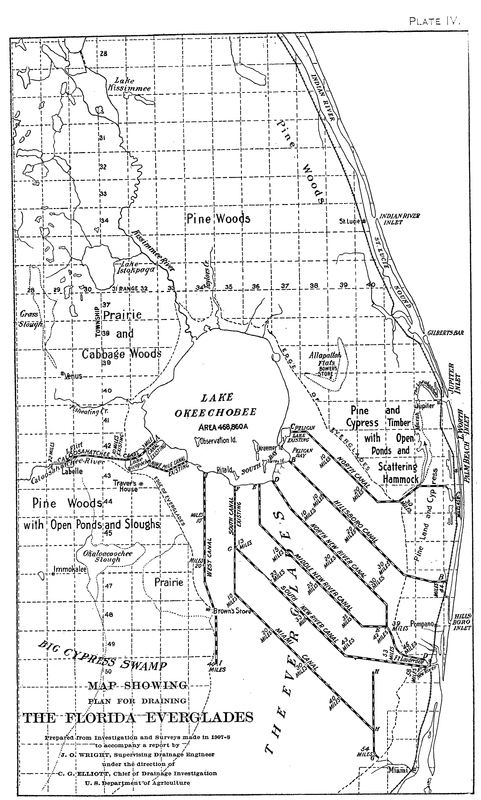 In conclusion, fertilizer (phosphorus and nitrogen) from corporate agriculture; poop from animals and people, (mostly nitrogen) and it is feeding, “fertilizing” Lake Okeechobee’s cyanobacteria blue-green blooms that in turn are poured into the St Lucie and Calooshatchee, which in turn this year are feeding, “fertilizing,” tremendous sargassum seaweed blooms, and red tide in the Gulf of Mexico and now in the Atlantic. These blooms are giant multi-celled intelligent, organisms, kind of like a bee-hive. They are hungry and determined and we are feeding them. It is a vicious cycle that only we can stop by forcing our government to take charge and coordinate municipal, state and federal programs of education and coordinated implementation. We know what to do. Developing an effective strategy for reducing the impacts of nutrients, easier understood as “fertilizer over enrichment,” requires all of us to change how we live and the powerful agriculture industry to lead. Otherwise, it is, and will remain, death by fertilizer. 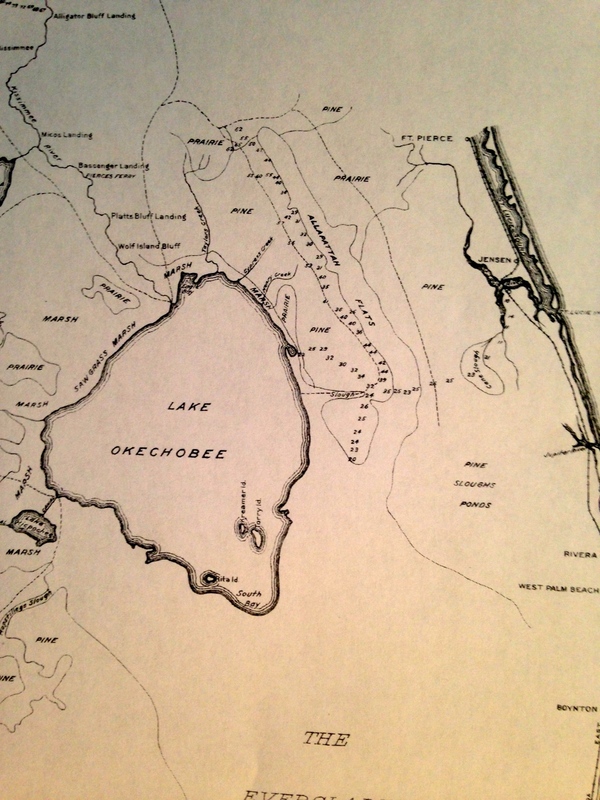 “Red tide was reported on the east coast in 2007 when it spread to the Treasure Coast south from Jacksonville where LaPointe said discharge from the St. John’s River may have aided its growth. 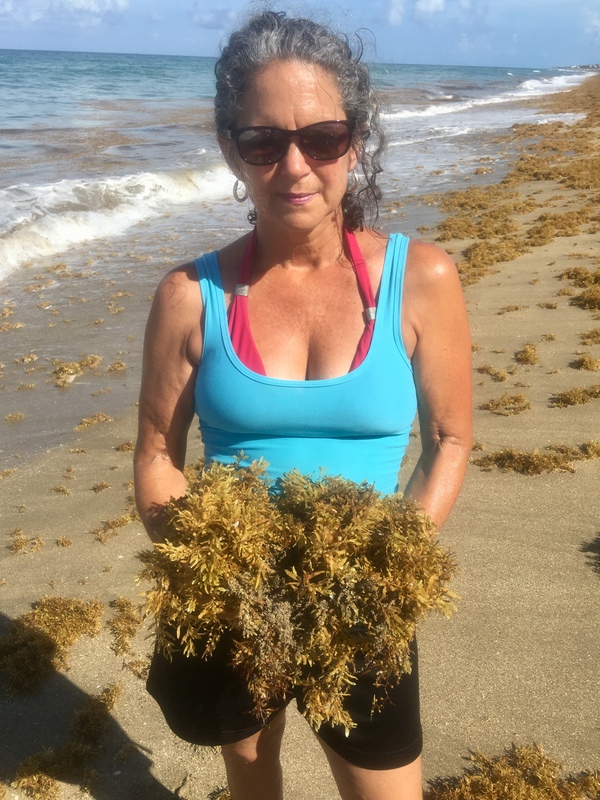 LaPointe said this summer’s plethora of sargassum on southeast Florida beaches could feed red tide with a boost of nutrients leeching into the ocean when the seaweed dies. 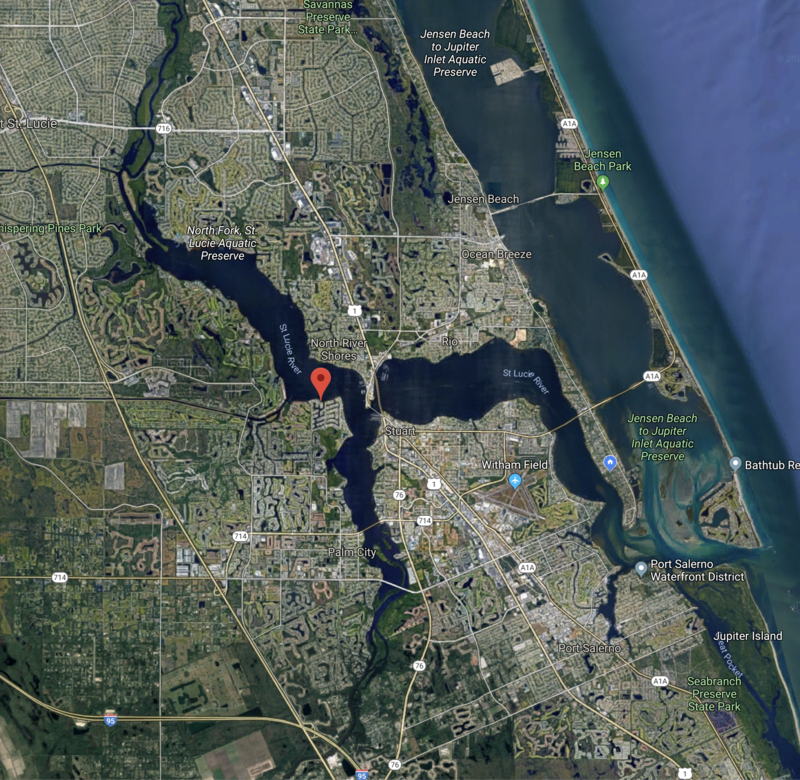 Red tide is different from the freshwater blue-green algae, or cyanobacteria, that has spread in Lake Okeechobee, the St. Lucie Estuary and the Caloosahatchee River this summer. 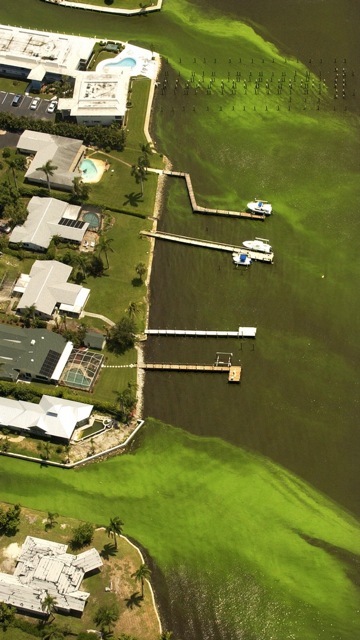 But red tide and the cyanobacteria both thrive in nutrient-heavy conditions. 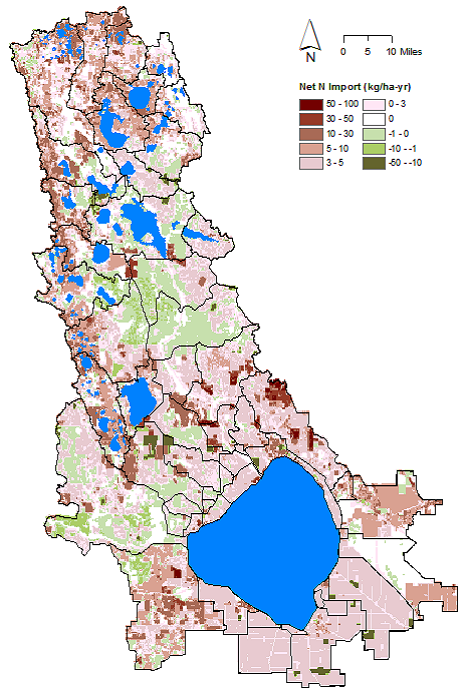 “Lake O and Estuaries’ Blooms: Not that this comes as much of a surprise. (Though state leaders feign shock with each new algae outbreak, as if they’ve just discovered gambling in Casablanca.) 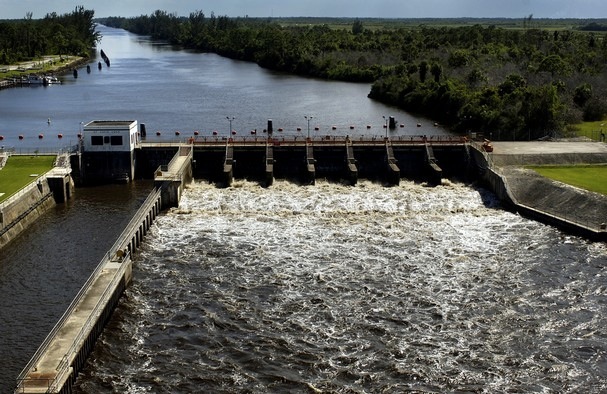 Environmental scientists have been warning Florida that the watershed lake was an environmental catastrophe since 1969.” Fred Grimm, reporting. 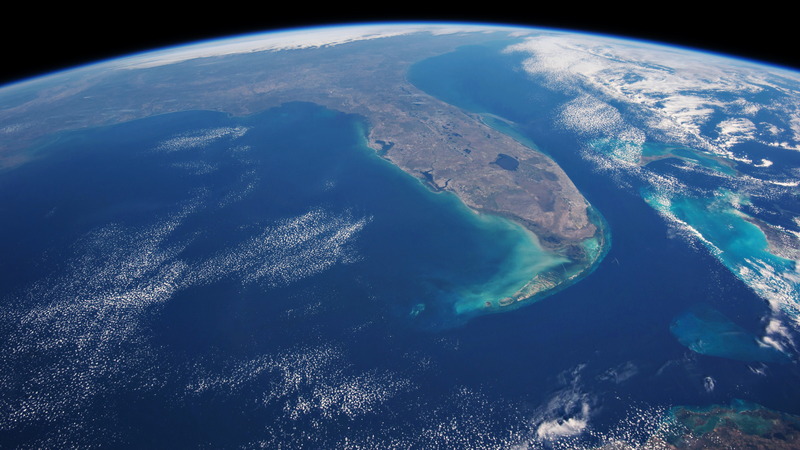 “Palm Beach Post:LaPointe is in the second year of a three-year NASA grant to study how nutrients are changing in the sargassum. 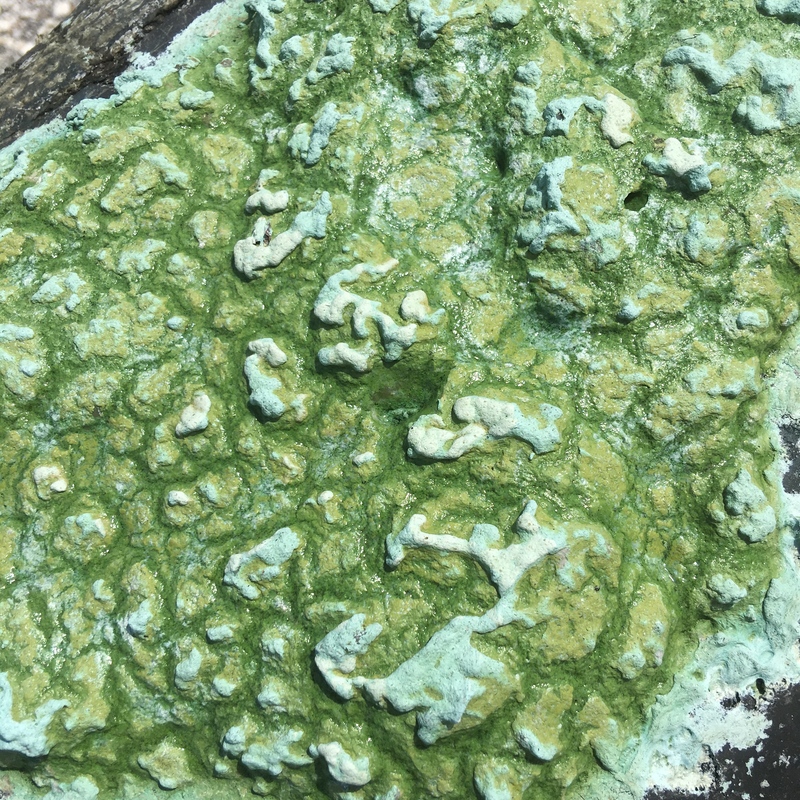 What he’s found so far is nitrogen levels have increased, likely from heavy doses of fertilizer and sewage runoff. 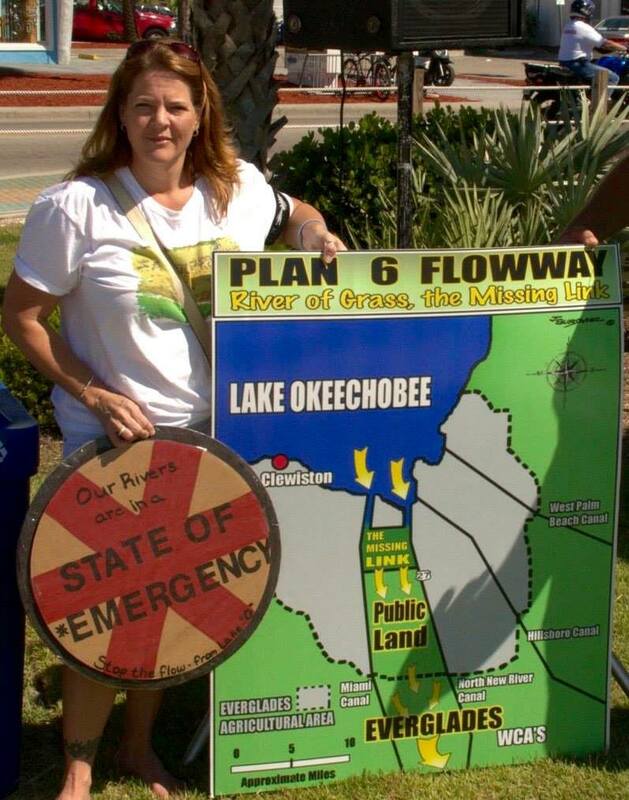 I first met Michelle Jones Connor during 2013’s “Lost Summer,” the year coffee colored, sediment-filled water flowed through the gates of the Army Corp of Engineers for most the year, from Lake Okeechobee into our St Lucie River/Indian River Lagoon. 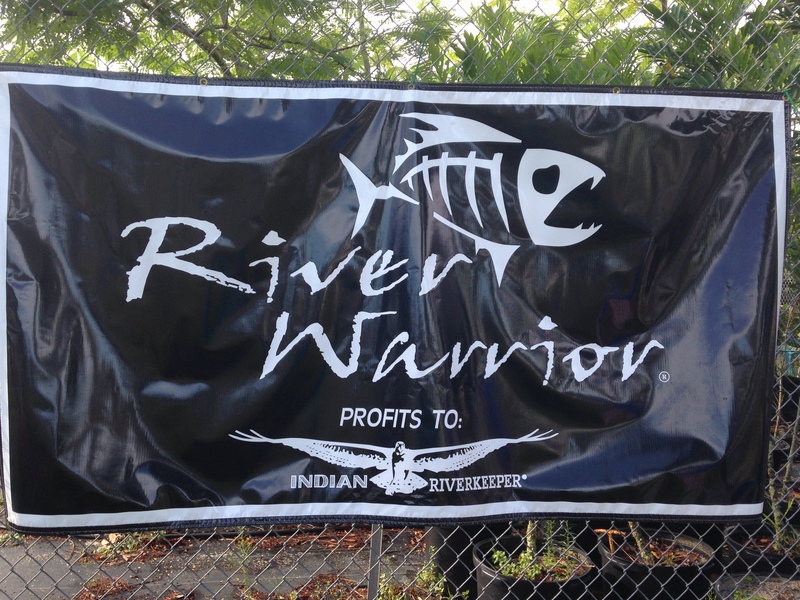 At that time, with energy surging as thousands of peoples’ anger ramped-up the River Movement, at a rally Michelle told me about her environmental-legend grandfather and grandmother, Johnny and Mariana Jones. 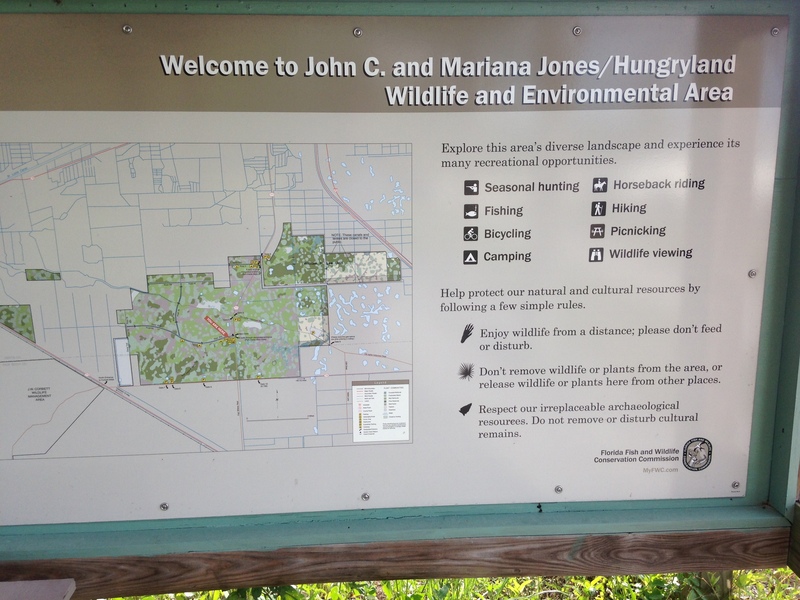 Ironically, not too long after this, my mother and father discovered the above plaque while on a field trip to the Hungryland, an area also named after the couple. Who were these incredible people? The list of their achievements is incredible! Almost impossible. Could we ever do something like that today? Of course we could; we just have to learn the tricks of the trade before they are forgotten. Michelle’s grandparents have recently passed as have so many other of the “greats.” We must fill their shoes. We have no choice but to do so. And learning from the past can be a great help along our journey. Thankfully, Michelle has given us some of the treasures of her late grandparents. Today I share with you, with the permission of Michelle, three things from the Joneses and their library. 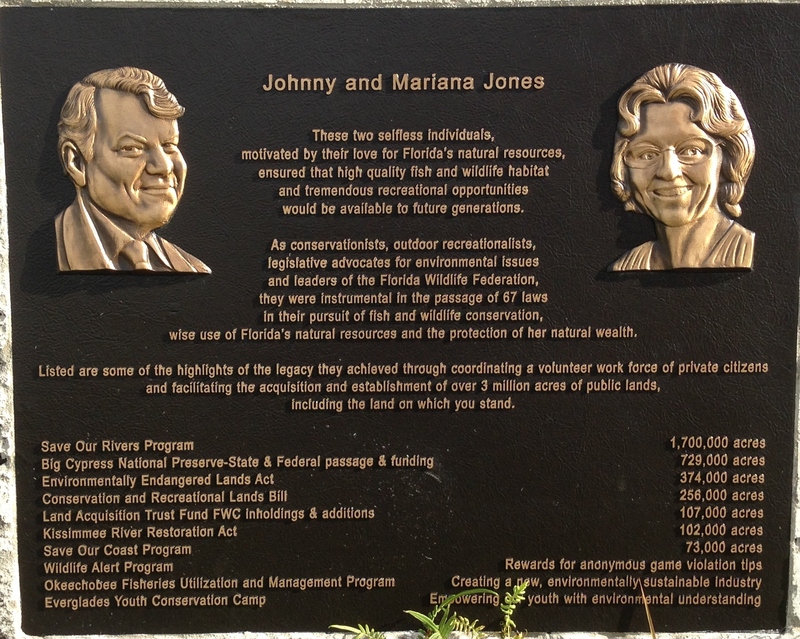 First, a fascinating and insightful 2001 University of Florida interview where Mr Jones answers the question: “What are the two or three most important contributing factors that have led to the present problems in the Everglades?”; Second, “The Marshall Plan, Repairing the Florida Everglades;” and third Johnny Jones’ “The Rain Machine,” my favorite, about how human greed, development, and canalization, and drainage of Lake Okeechobee and surrounding areas altered Florida’s water cycle ~and thus Florida’s weather itself ~by removing so much water from the land. Upon reading, you will notice names, such as Marjorie Stoneman Douglas, Arthur R. Marshall, and Nathaniel Reed ~just to name a few. 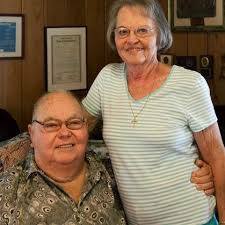 In spite of the difficulties, pressures, and of course the hottest potato, politics, it was relationships and perseverance that allowed the Joneses to achieve so much. We must do the same. Thank you Michelle for sharing these rare and valuable documents. We shall honor the legacy of your grandparents and be inspired..
Michelle Jones Connor 2013, Lost Summer, Michelle is the granddaughter of the late, great Johnny and Mariana Jones. Hungryland Field Trip, Sandy and Tom Thurlow, 2014.